It was not very long ago — at least in evolutionary terms — that humans first ventured beyond the continent of their species’ birth. But once people did begin migrating out of Africa about 50,000 years ago to populate the lands we now call the Middle East, Asia, Europe and the Americas, the transformation of the species, and the planet, was swift. Now, 2,000 generations later, 23andMe is launching a new feature that can help you see the traces of those ancient voyages in your chromosomes. As populations became separated over the millennia, small genetic differences developed that can still be used as signatures of geographic ancestry. Ancestry Painting looks at those signatures in the 22 numbered chromosomes (that is, all but X and Y) to infer where in the world the ancestors who passed you each stretch of DNA were most likely to have lived — Africa, Asia or Europe. Ancestry Paintings essentially give you a snapshot of where your ancestors lived before the beginning of the colonial era about 500 years ago. That’s because the massive migrations that have occurred since then have blurred many of the genetic boundaries that had developed over the millennia. For example, most Americans trace their ancestry not to the continent where they live but to Africa, Asia, Europe or a combination of those places. The best way to understand Ancestry Paintings is to take a look at some. Her painting is nearly uniformly navy blue, an indication that all of her chromosomes come from European ancestors. There are a few brief stretches of orange (meaning Asian ancestry), but in light of the overall pattern it is more likely that the orange stretches are statistical “noise” than indicators of true Asian descent. Now suppose that woman had a child with an African man. Because each person has 22 pairs of numbered chromosomes — one from each parent — Ancestry Paintings depict both in a single band. So the child of a mother with fully European ancestry and a father with fully African ancestry would have a painting consisting of 22 half-navy and half-green stripes. It’s in subsequent generations that things really get interesting. For example, this is the painting for a man who identifies himself as African American: Genetic studies show that most African Americans have at least some European ancestry, and that finding is borne out by this man’s Ancestry Painting. In fact, all the chromosomes are at least half blue, suggesting that this person has one parent of fully European ancestry. The solid blue color in some stretches indicates at least partial European ancestry for the other parent, whereas the stretches that are half blue and half green indicate African descent from one parent and European from the other. 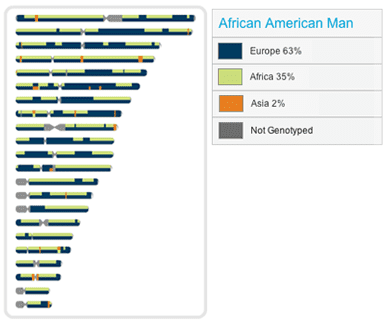 The overall fraction of each type of ancestry — African, Asian and European — is tabulated in the legend in the upper right of the display. Log into your 23andMe account to find many more examples of paintings from individuals from around the world, along with descriptions of the events in human history underlying each and more detailed information about how to interpret them.